This presentation demonstrates how the PERMEATOR system works to recover fuel storage tank evaporative losses, cleaning the air and saving gasoline. 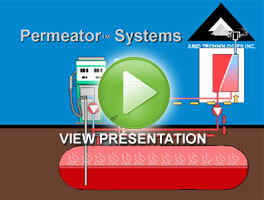 In this video, Ted Tiberi explains how the PERMEATOR benefits both station owners and consumers of the local installation to ABC affiliate in Pennsylvania. Whenever gasoline is transferred between two tanks; from a storage terminal to a tanker truck or railcar, from the tanker truck to a fueling station, or from the fuel station nozzle to your car, gasoline vapors are generated and escape into the atmosphere. ARID Technologies, Inc. offers smart solutions for reducing these emissions of fuel vapors while at the same time yielding an increase in salable product. ARID's On-Spot railcar loading and Membrane CRU systems are offered at bulk terminal operations where railcars and tanker trucks are loaded. In addition, ARID's PERMEATOR system is provided at gasoline stations. The Membrane CRU and PERMEATOR systems utilize a patented hydrocarbon selective membrane which preferentially separates fuel vapors from air. These systems reduce harmful emissions, save fossil fuels, and provide a safer and healthier environment for storage terminal and service station customers and employees.